SINCE THE DANCE METAPHOR in relation to which the entrepreneur was portrayed as a three-legged dancer proved so useful in setting the stage for the introduction of the concept of Trilateral Entrepreneurship, the temptation to re-visit dance in the hope of gleaning new insights and learning new lessons that are both relevant to entrepreneurship and capable of strengthening the case for the paradigm shift that Trilateral Entrepreneurship represents is absolutely irresistible! The new lessons on dance begin with the recognition of the fact that beyond being a form of art and a means of physical and emotional expression, dance is also a medium of communication. The key to understanding the communication dynamics of dance is to recognize the fact that the dancer dances primarily because he is able to hear the music to which he is responding. The reality is that without the ability to hear any music being played either from a pre-recorded musical system or by a standing music band, there will be no dance. But, the dancer does stop at merely proving his ability to hear the music that he is called to respond to, he also proves his ability to accurately interpret the sounds, message and meaning of the music that he hears into a distinct pattern and style of bodily movements and routines that thrill to the extent of adding measurable value to his audiences. By his ability to accurately interpret the sounds, message and meaning of the music that he hears into a distinct pattern and style of dance that thrills his audiences, often to the extent of drawing their loud applause, the dancer proves that he is not merely a physical performer, but much more than that, he is a professional who is literally thinking on his feet! You know what? Dance is serious business that has theoretical, philosophical and practical dimensions that can only be surveyed and harnessed by actors who are good hearers and thinkers! Given the right music, it takes good hearing and thinking to be a great dancer. Like dance, the concept of Trilateral Entrepreneurship has theoretical, philosophical and practical dimensions which need to be thoroughly understood towards laying a solid foundation for its distinctive practice as the new paradigm of profitable business. Just as a skilled dancer surveys and harnesses music on the strength of his good hearing and thinking, the survey and harnessing of the theoretical, philosophical and practical nuances of Trilateral Entrepreneurship require good thinking. While the music that is played is what ignites the dancer’s thinking, thinking on the theoretical, philosophical and practical dimensions of Trilateral Entrepreneurship is ignited by the ideas and designs that the graphic that is shown on Page 2 communicates. 2. Trilateral Entrepreneurship challenges entrepreneurs to operate with the understanding that every product or service derives its profitability directly from the assurance of the right balance between its underlying Operating, Financing and Investing activities and this means that commitment to profitability must be evidenced by commitment to the assurance of optimal trilateral alignment and synergy between profit-impacting activities 3. Trilateral Entrepreneurship demands the ability to operate on the basis of a threedimensional view of any target economy, industry or market in terms of the range of Operating, Financing and Investing opportunities that it offers relative to competing economies, industries and markets 4. The key measure of good entrepreneurial thinking is the ability to consistently think both within the context of the interplay between Operating, Financing and Investing activities that are needed to ensure the profitable, competitive and sustainable delivery of a product or service and towards generating creative ideas that can be used to increase the alignment and synergy between these three groups of high-value activities 5. Entrepreneurial leadership is impossible without the ability to be distinctive in the creation of the alignment and synergy between Operating, Financing and Investing activities that is needed to ensure the profitable, competitive and sustainable delivery of a product or service 6. It is impossible for any business to earn profit on a predictable and sustainable basis without being fundamentally rooted in and driven by the fundamental designs and workings of Trilateral Entrepreneurship 7. The reality is that the stability of all businesses as well as their profitability, growth, competitiveness and sustainability are all inextricably tied to the fundamentals of Trilateral Entrepreneurship 8. To be entrepreneurial means to know how to profitably and competitively deliver a specific product or service on the fundamental basis of distinctive Trilateral Entrepreneurship 9. The absolute validity of the concept of Trilateral Entrepreneurship is conclusively-proven by the evidence that the most ingenious invention or innovation can easily prove a colossal market failure if it is not supported with thoroughly-grounded Trilateral Entrepreneurship disciplines and skills 10. The higher the trilateral alignment of a business, the stronger its fundamentals and the higher its potential profitability. The reverse is also true, the lower the trilateral alignment of a business, the weaker its fundamentals and the smaller its potential profitability 11. No enterprise can achieve a level of profitability that is higher than its degree of trilateral alignment and synergy and 12. While all thriving businesses are beneficiaries of good Trilateral Entrepreneurship, all unviable or failed businesses are victims of poor Trilateral Entrepreneurship! These thoughts are inspired by the idea that a profitable product or service can only be the direct result of profitable entrepreneurship that works through the trilateral alignment and synergy between the Operating, Financing and Investing activities of the entrepreneur or enterprise responsible for its development and delivery to market! These thoughts are especially important because they are unmistakable pointers to the most relevant, indispensable and inescapable ground-rules of business profitability which are equallyapplicable to all small, medium and large-scale business enterprises as well as other profitseeking entities! The two levels of trilateral alignment The thoughts on the theoretical, philosophical and practical imperatives of the concept of Trilateral Entrepreneurship are also especially important because they indicate that trilateral alignment spans two critical levels which include Primary Trilateral Alignment and Secondary Trilateral Alignment. 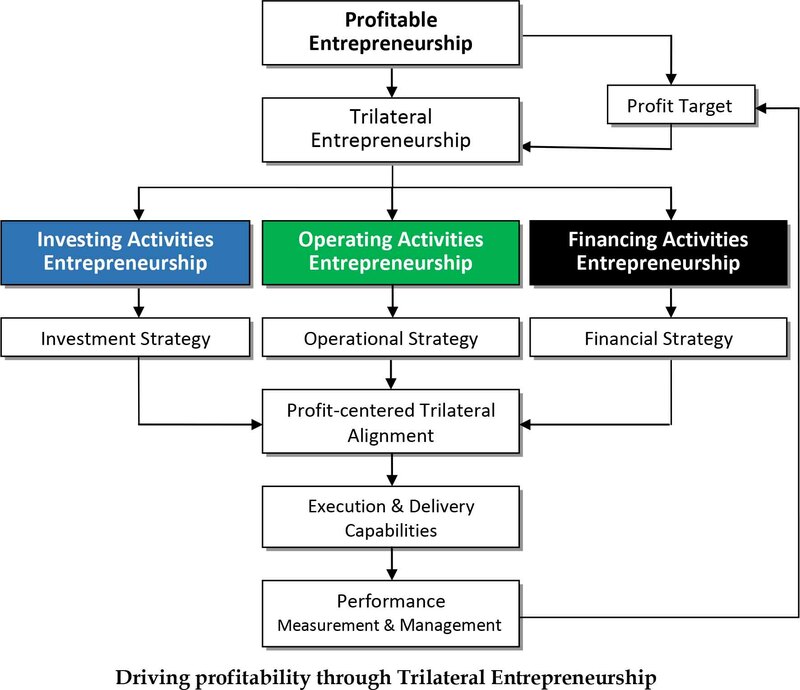 While Primary Trilateral Alignment is concerned with increasing the synergy between the Operating, Financing and Investing activities of a business, Secondary Trilateral Alignment is concerned with increasing the synergy between the three critical stages of entrepreneurship which include:  Product/service capability development stage  Support activities (Operating, Financing and Investing) capabilities development stage and  Execution and Delivery capabilities development stage Trilateral alignment is a matter of technical skills, discipline and craftsmanship and all these require thorough grounding in the theoretical, philosophical and practical nuances of the concept of Trilateral Entrepreneurship. The ability to develop and deploy the technical skills, entrepreneurial disciplines and craftsmanship that are the critical means of creating, increasing and sustaining the primary trilateral alignment between the Operating, Financing and Investing activities and the secondary trilateral alignment between the product/service capability development, support activities capabilities development and execution and delivery capability development stages of a business is the defining mark of entrepreneurship. Thus, the most fitting conclusion to this month’s discourse is to reiterate the thought that the absolute validity of the concept of Trilateral Entrepreneurship is conclusively-proven by the evidence that the most ingenious invention or innovation can easily prove a colossal market failure if it is not supported with thoroughly-grounded Trilateral Entrepreneurship disciplines and skills! Needless to say that there is absolutely nothing entrepreneurial about any business that lacks trilateral alignment. Tony Elumelu Foundation to train 50 additional Beninoise entrepreneurs.